Savvy is a monthly family magazine reflecting the unique style, interests and needs of central Arkansas families. L'Italo-Americano is a weekly newspaper that has served the Italian-American community for over a century, striving to preserve Italian culture and keeping the Italian-American community together. The newspaper uses thoughtful and creative ways to reconnect with its current readers, continues to attract new readers and bridges gaps between generations. L'Italo-Americano continues to grow and endure in a global 21st century. 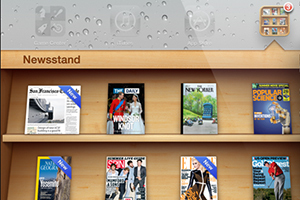 Publishers and vendors continued to launch a large number of new apps in 2014 despite Apple's apparent neglect of the Newsstand. October was a record-setting month for newspapers online, with 166 million U.S. adults consuming newspaper content delivered via digital platforms, according to the Newspaper Association of America, citing figures from comScore. That is an increase of 17% (24 million) over October 2013, when 142 million adults consumed digital content from newspapers. Over the first 10 months of the year, monthly digital audiences for 300 U.S. newspapers tracked by comScore increased by around 20 million, the NAA said. In proportional terms, eight of ten online adults accessed digital content from newspapers in October 2014. The proportion was even higher for subgroups including women ages 25–34, where 91% visited a newspaper digital property, and men ages 35–44, where it reached 84%. There was a big increase in the number of people accessing newspaper content exclusively through mobile devices including smartphones and tablets, up 85% in October 2014 compared to the same month last year. Some segments saw even bigger increases, with the number of mobile-exclusive women ages 18–24 jumping 173%, while the number of mobile-exclusive men ages 25–34 grew 112%. While the growth of their digital audience is undoubtedly welcome news, the fact remains that digital advertising is still a relatively small part of the overall business for newspaper publishers. According to the NAA, digital advertising revenues came to $3.42 billion in 2013, up 1.5% from 2012. That is 14.5% of newspapers' total advertising revenues. On the other hand, online paywalls seem to be having a positive impact on the bottom line, with circulation revenues up 3.7% to $10.87 billion. That's not far off the peak value of $11.2 billion achieved in 2003, before print circulation entered a precipitous decline. Over the last decade, total newspaper advertising revenues, including digital, have fallen from $49.4 billion in 2005 to $23.6 billion in 2013 – a 52.2% drop. The annual figures for 2013 are the most recent available, following the NAA's decision to stop reporting quarterly revenues last year. According to the 2014 Publishers Survey Report from Lyris, engaging audiences with targeted and personalized email content is proven to create new revenue opportunities for publishers, but many are still struggling with even the basics of email marketing and digital messaging. 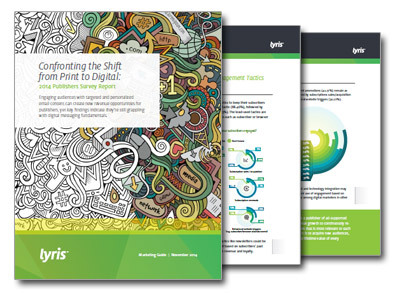 To better understand the industry's challenges and underused opportunities, Lyris sponsored a survey in partnership with FOLIO, a multi-channel resource for the magazine and online media industry. Publishers are using a variety of tactics to keep their subscribers engaged, says the report. 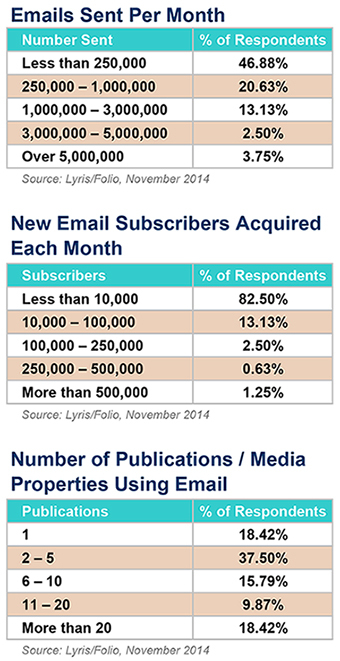 Newsletters are the most-used tactic, followed by event promotions and subscription renewals. The top two tactics that have proven very successful in ecommerce verticals are the least-used tactics for publishers: welcome programs and behavioral website triggers. But publishers are relying too much on traditional engagement tactics like newsletters and trailing in the adoption of more interactive engagement programs based on subscribers' past and current behaviors, which have been shown to increase revenue and loyalty multiple fold, says the report. Newsletters and event promotions remain the top two tactics in terms of planned growth, followed by subscription sales/acquisition, subscription renewals and behavioral website triggers. By largely neglecting tactics for engagement based on behavioral website triggers – which have long proven themselves as a must-have among digital marketers in other industries – publishers are leaving the field wide open for more digital marketing-savvy competitors to steal their show. 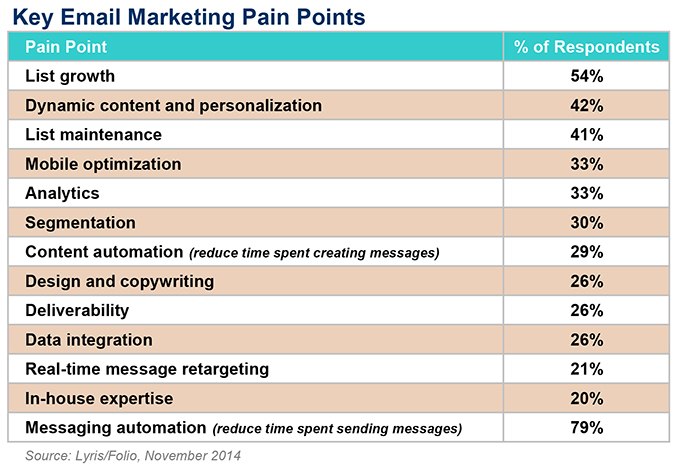 The top pain point for email messaging is list growth, followed by dynamic content and personalization, list maintenance, and mobile optimization. Outside of dynamic content, the findings indicate that traditional marketing issues continue to impede progress. List growth and maintenance, for example, are the most important factors in successful email messaging. No matter how good the promotion or creative, without a good list, response will not be satisfactory. Just over one-third of respondents say their emails are fully mobile optimized. Another third are part of the way there and plan to complete the process in the next 12 months. Two smaller groups indicate that they haven't started yet and aren't sure where to begin, or haven't started yet but plan to in the next year. Mobile optimization is gaining traction for publishers, but too slowly. This is surprising, given the explosive adoption of mobile devices, expected to reach 8 billion subscriptions in 2016, and the fact that as much as 65% of email is now viewed first on mobile. Seventy-nine percent of respondents don't have a strategy in place to engage with inactive subscribers, leaving a significant revenue opportunity untapped. Re-engagement programs are proven to yield big results in terms of return on investment. They also help senders protect their domain reputations by recapturing the attention of inactive subscribers and reminding them of the benefits of receiving their emails, says the report. The implications for publishers is that technology by itself is not a subscriber engagement strategy. The challenges of integrating traditional and digital marketing, along with managing and optimizing audience relationships, call for a strategic approach to communications, concludes the report. However, tailored digital messaging to subscribers via the channels they prefer and that leverages best practices often remains out of reach for publishers who lack the required expertise and bandwidth. Seventy-seven percent of respondents say they integrate their email messaging with social, followed by blogs (35.80%), CRM (30.86%) and public relations (30.25%). The stated use of social media integration seems high, opines the report, and suggests that respondents may simply be adding social media icons to their emails rather than having a fully-developed integration strategy. Social can be a very effective tool for gaining new subscribers, yet list building was called out as the top pain point for the majority of respondents. Linking these two efforts can produce significant results. The revised guidelines will be available on Verified's website. 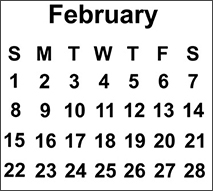 To access the guidelines, click on Members on the homepage and then Procedures & Regulations. You will need your username and password to download the revised guidelines.